“So Horton stopped splashing. He looked towards the sound. “My friends!”, cried the elephant. The Facilities Access Policy to which this dynamic duo are referring was updated on December 16, 2011. Shortly after the new ‘Policy’ was unveiled, the Department of Administration held three “Information Sessions” in the basement of the state capitol, led by DOA deputy secretary Chris Schoenherr. Also in attendance from the secretary’s office were Wendy Coomer Dean, Executive Assistant, and newly appointed communications director (and Karl Rove protégée) Jocelyn Webster. Over the course of the three sessions, which totaled over seven hours, not once did DOA officials bring in legal counsel to defend the department’s new rules. A veritable A-team of attorneys did show up, however, to ask questions on behalf of the public. “You’re going to be roped! And you’re going to be caged! 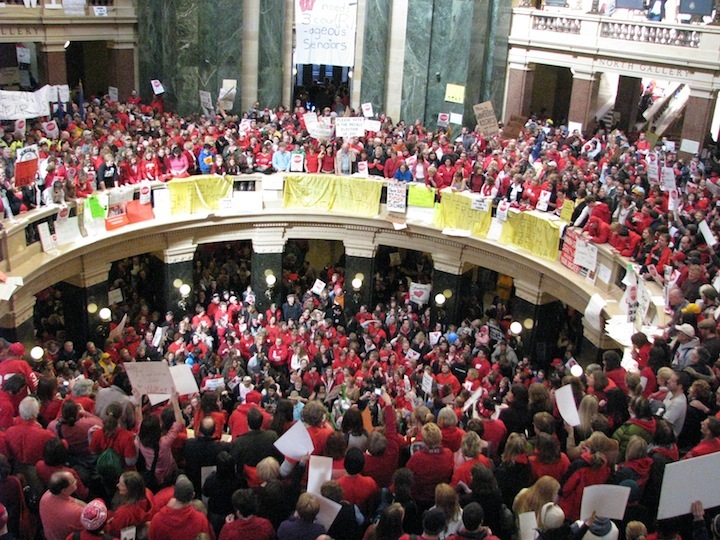 Protesters gather in the capitol rotunda in February 2011 in opposition to Governor Walker's "Budget Repair Bill"
This year, Valentine’s Day coincided with the one-year anniversary of the start of the Wisconsin Uprising, which is the longest sustained protest in the state’s history — a protest that began in the capitol rotunda. But despite this momentous event, which was obviously likely to spur people to come back to the capitol to commemorate the day, three weddings were scheduled for February 14th in the capitol rotunda. The first wedding was still going on up on the first floor when people began gathering inside on the ground floor for the noon-time Solidarity Sing Along. The woman leading the Sing Along that day informed people of the wedding ceremony, and asked that they keep voices down so as not to disrupt the event. The start of the Sing Along was delayed until the signal was given that the wedding was finished. Shortly before 1 p.m., a large group of UW students streamed into the rotunda and joined the people already gathered there. They participated in singing a couple of songs, with the song leader promptly wrapping things up by 1:02 p.m. She alerted one of the student group leaders to the fact that another wedding that was scheduled to begin at 1 p.m., and she also notified a group of Capitol police officers that the Sing Along was officially over for the day. Although big events were coinciding in the capitol last Tuesday, the Solidarity Sing Along did not interfere in any way with the three weddings that were scheduled for the public space. In fact, the Sing Along has a policy of not interfering with permitted events, often taking the singing outside if necessary. Couples who want assurance that their wedding ceremony will be free from disruption often reserve the Senate Parlor for their nuptials. ← Who ordered the pie at the Inn on the Park? Thank you for setting the record straight and refuting the MacIver Institute’s lies, which Reps. Craig and Farrow sadly relied on to state their case to Mike Huebsch. They derisively and snidely put “one-year anniversary” of the largest sustained citizen uprising in our state’s and nation’s history inside quotation marks to express their opinion of We the People’s right to peaceably assemble and petition their legislators. Even sadder is that the original story put out by MacIver’s spin machine that is resonating inside the right-wing echo chamber will never be corrected and will take on a life of its own. What kind of foresight did the DoA use in anticipating that Feb. 14 might bring large numbers to the People’s House, which is the seat of government and not a wedding chapel? Perhaps I can address that. I’m a wedding officiant. Valid officiants include public positions, such as a mayor, a Supreme Court Justice, Municipal Judges (and others). Ceremonies are often conducted in public spaces such as the Capitol, parks, or a specific room within the Capitol if reserved. I could marry a couple at the Capitol if they reserved the space. DOA didn’t make this up, nor is it unique to Wisconsin. It’s been common practice for a long time. 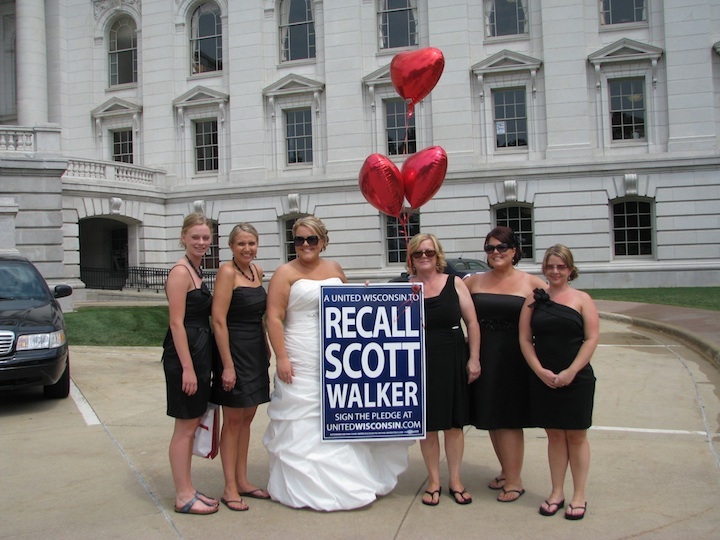 Many nefarious practices can be attributed to DOA but weddings inside the Capitol isn’t one of them. “Ceremonies are often conducted in public spaces such as the Capitol, parks, or a specific room within the Capitol if reserved.” This is true. However, your own list includes three public spaces that offer possible varying degrees of peace and quiet. Can a couple who reserve a park shelter for their wedding ceremony expect the children playing on the swings nearby to keep their voices down? Can the organizers of the Concerts On the Square tell the Dane County Airport to reroute airplanes so as not to interfere with a Mendelssohn overture? There is an inherent risk in scheduling a ceremony in a public space, and there is probably no public space in Madison more likely at the moment to have members of the public congregated than the capitol rotunda. As my article points out, the Solidarity Sing Along always moves outside if their singing would interfere with a permitted event. They do this as a courtesy, not because they are required to do so. Perhaps those considering a wedding in the capitol should look to the Senate Parlor if they hope to have a ceremony free from disruptions. passed to restrain or abridge the liberty of speech or of the press. Well stated, Nicole. I and the other 999,999 disillusioned few thank you. The Craig/Farrow letter certainly qualified as a trigger for a spontaneous event. On Feb. 14 I was on the first floor with a sign. There was a small group of people behind us, which apparently was a wedding party. 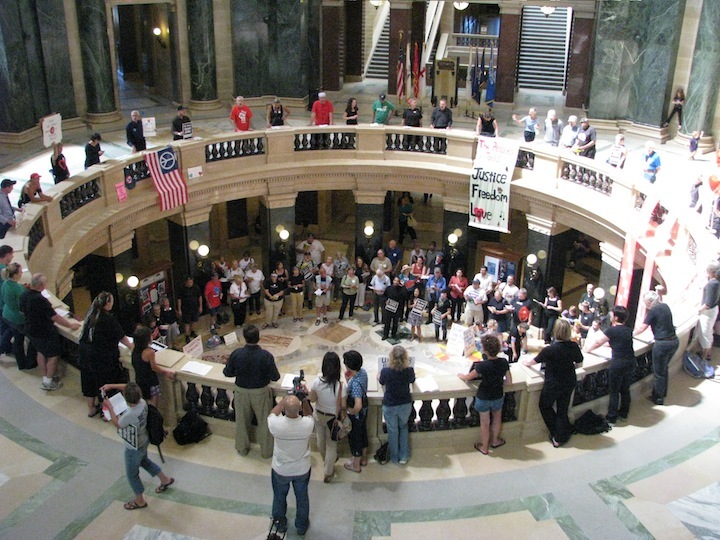 At 1, after the Singalong was done, there was a large group in the rotunda, because of the march, and anniversary of the rally last year, as the article states above. Chief Tubbs stood next to me, pointed at the group and muttered “They can’t do that.” Then he said something about the group behind us having a permit for their wedding. I asked if they could use the basement (since that’s only used for arrests and those haven’t happened much recently. He said no, that they had a permit for the rotunda. He made no announcement though. Then the next day he talked to a few of us and said he’d gotten lots of complaints, and that the couple had been for our cause. I asked about the wedding the Saturday before – that there was an announcement and people had moved and were very nice, even oohing an awing. He agreed, but said nothing about why he hadn’t made a similar announcement on the 14th. Maybe he was hoping to get the reaction he did, so he would have an excuse to shut things down. This policy is a mistake. It should be challenged in court as a 1st Amendment violation. It was only a matter of time until the Republicans would pull this. This is all so disturbing. Disturbing enough that I am at the moment, speechless. cooperative. With the number of people and all the chanting and talking, how would anyone know if a wedding party was being inconvenienced unless the police announced this to the crowd? I doubt that the protestors “refused” to leave, they didn’t know that there was a good reason to leave at that time.